Necessity is the mother of invention and that’s how this recipe came about. My bell peppers are still coming on strong and I had some cooked chicken in the fridge so I decided to make a creamy south of the border type casserole. I’m so glad I did because it turned out seriously amazing and I’ll definitely be adding it to my recipe box. Plus, it’s fast, frugal and freezer friendly! I promise your family will love it too so here’s the recipe. Step 2: Sauté onions, peppers and garlic until soft. Step 3: Mix all ingredients except shredded cheese. Step 4: Pour mixture into greased casserole dish. Step 5: Sprinkle cheese on top. Step 6: Bake for 20 minutes. Sauté onions, peppers and garlic until soft. Mix all ingredients, except shredded cheese. It's really good!! I need to make it again sometime soon! I found this great post from the Frugal Friday Link Up Party! 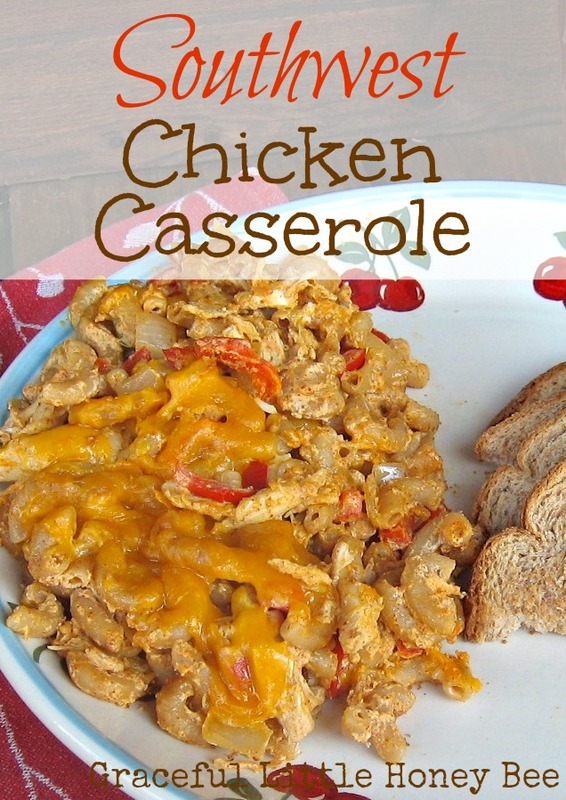 This chicken recipe looks delish! Gonna give it a try this weekend. Thanks for sharing. I bet it IS good! Thanks for linking up to Show Me Saturday. Hope to see you there again this week! We are trying to do less wheat. Do you think you could either do this over baked potatoes or rice, or use recipe as is substituting cottage potatoes for the pasta? I'm sure it would be good over rice or potatoes. After you put it all together, simply freeze in a covered pan. Can you think of a way to do this without sour cream? Looks delish but I have a kiddo w/ dairy allergies (I already have a dairy free cheddar cheese) Thanks! You could try salsa or tomato sauce instead of the sour cream.